It is a very important exit management device for the parking lot. As everyone knows, the basic function of Exit Ticket Verifier can validate a ticket for the vehicle users, but as the KEY equipment at exit of parking lot, except the normal and stable operation, we have to know it needs to support a few KEY technical features that are very important for the management of parking lot. The user can insert the ticket into ticket verifier in 4 ways: barcode upwards/ downwards/forwards/backward. 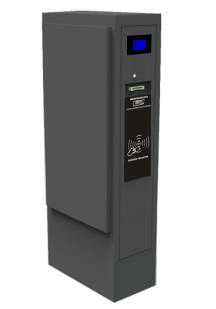 The ticket collector inside ticket verifier can hold thousands of tickets, it can help the owner reduce the daily operation and maintenance work. The ticket verifier can recognize back out the ticket so that can prevent a thief from stealing cars from the parking lot. To the outstanding tickets, ticket verifier will not collect ticket but display the prompt on the LCD display to remind user pay parking fee. It will help parking management reduce disputes. All tickets will be collected in ticket verifier before user exit, it will make the audit work easy.